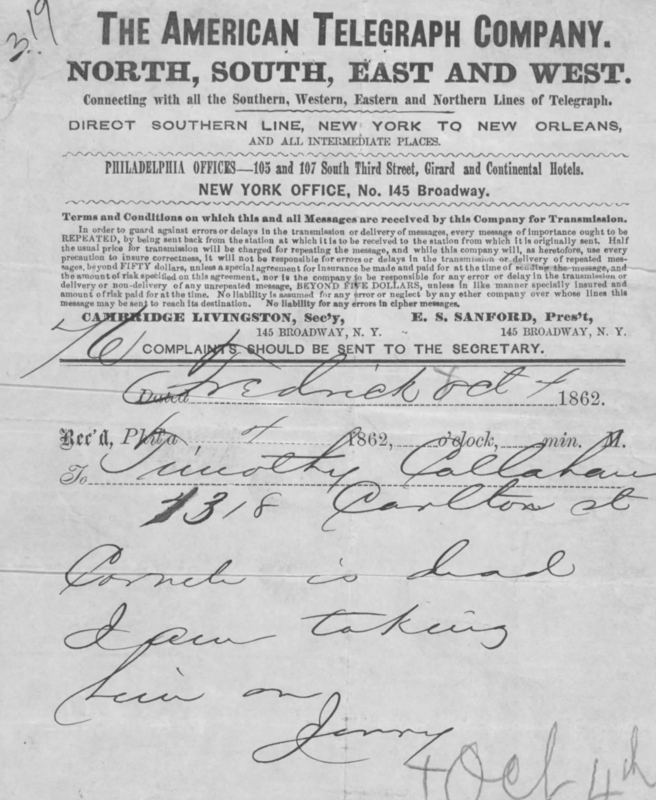 Cornelius Callahan was an early enlistee in the Union cause. He was barely 18-years-old when he volunteered in Philadelphia. A founder by trade, he was described as having a light complexion, blue eyes and light hair. Knowing that Cornelius’s parents Timothy and Johanna (née Nagle) were married in Ireland during the late 1830s allows us the rare opportunity to precisely identify where Cornelius hailed from. Recourse to the Irish Catholic Parish Registers, recently made available online, reveal the young man’s baptism on 6th August 1843 in the village of Grenagh, Co. Cork (the site recently explored another family from Grenagh– see here). Cornelius marched off to the Civil War as a private in Company G of the 2nd Delaware Infantry. The village of Grenagh, Co. Cork, where Cornelius Callahan of the 2nd Delaware Infantry was born. At Antietam, on 17th September 1862, the 2nd Delaware were part of Brooke’s 3rd Brigade of Richardson’s Division, Second Corps. The 2nd Brigade of that division was Thomas Francis Meagher’s Irish Brigade. Cornelius and his comrades had been in reserve while the Irishmen launched their assault towards the Bloody Lane, and afterwards crossed much of the same ground as part of their brigade’s initial drive towards the Piper Farm. Cornelius may well have seen some of his wounded and maimed countrymen as he and the Delawareans advanced towards the foe. At some point during that advance, Cornelius was struck by a shell, and himself severely wounded. The site of General Hospital No. 3 in Frederick, Maryland, where Cornelius Callahan was treated for his Antietam injuries. Corneal is alive. I am with him. Jerry. The modern day Carlton Street in Philadelphia, much changed from when the Callahans of Grenagh made it their home. Cornel[ius] is dead. I am taking him on. Jerry. The 19-year-old Grenagh man was buried in St. John the Evangelist Roman Catholic Church in Frederick; his burial in a Catholic cemetery may have been the result of Jerry’s intercession. The two telegraphs from The American Telegraph Company did not spend long in the Callahan’s possession. Joanna submitted them both as part of her pension application to prove the fate of her son, in the process preserving them for us to see. 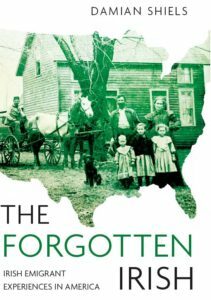 The Callahan story is a yet another example of the double-trauma this site often revisits– a family who left Ireland in hope of a better life, only to suffer catastrophic loss during the American Civil War. 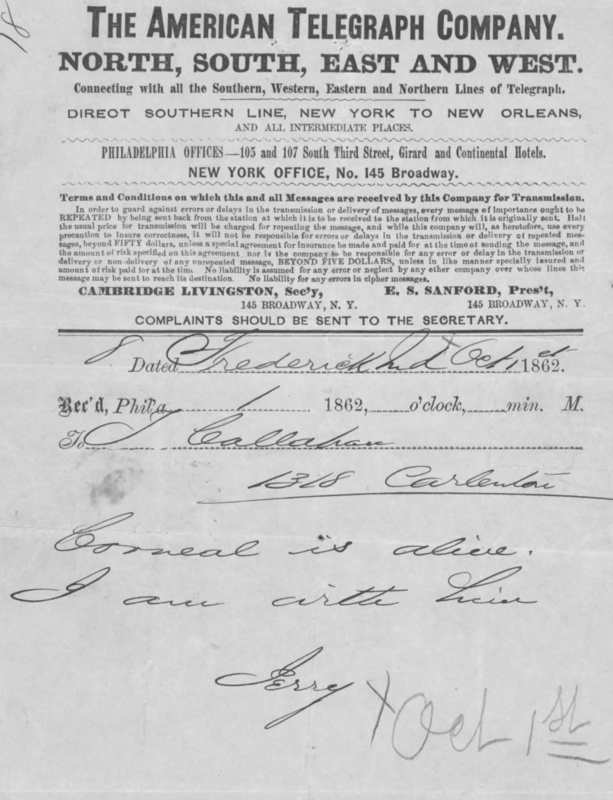 Widow’s Certificate 2068 of Joanna Callahan, Dependent Mother of Cornelius Callahan, 2nd Delaware Infantry. Catholic Parish Register for Grenagh, Cloyne, Cork. National Library of Ireland. Civil War Trust Battle of Antietam Page. 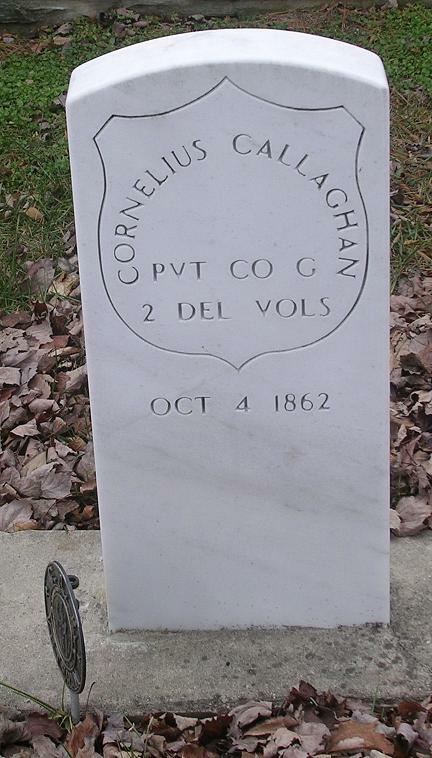 Cornelius Callahan Find A Grave Memorial.